This week I got the most gorgeous pointy head of green cabbage I’ve ever seen. It was so becoming I kept it out of the crisper drawer so I could lovingly admire it every time I opened the fridge. I thought about my head of cabbage often, wondering what would be the best way to cook it. My friend the Comedienne cooks my favorite cabbage as a side to her best baked chicken ever – or should I say an under, since it cooks under the chicken, absorbing all the juices and drippings. It’s delicious. But this cabbage deserved to be the star of the show, the main event. I remembered Molly from Orangette describing how much she liked eating cabbage; she cooked it with hot sauce and she could eat it every day. I wanted to make cabbage like that. 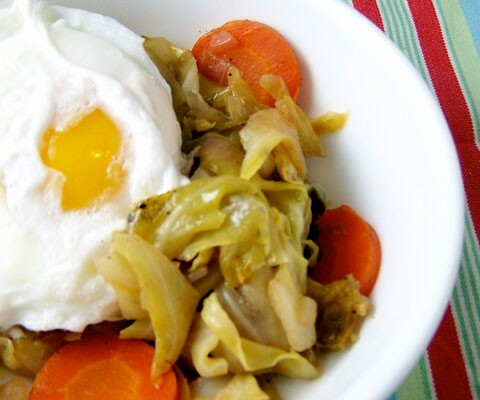 I searched her site and found 2 more cabbage recipes (braised) – a stove-top braised recipe for red cabbage and an oven-braised recipe for green – so I switched out the cabbage color to make my own stove-top braised green cabbage with CSA carrots and a poached egg. I used my sweet, sweet head of green cabbage, substituted one of my favorite white wines for the chicken stock/water, opened some good sea salt, and finished it with artisan olive oil from Santa Barbara wine country. Molly was right; I could eat this cabbage every day. You can eat this stove-top wine-braised cabbage every day! I added carrots and used my sweet, sweet head of green cabbage, substituted one of my favorite white wines for the chicken stock/water, opened some good sea salt, and finished it with artisan olive oil from Santa Barbara wine country. Heat oil in a large skillet over medium heat. Add onions and carrots and cook until onions are translucent and slightly golden. Add cabbage, wine, salt, and seasoning. Cover pan and cook over medium-low heat, stirring occasionally, until the cabbage is very soft but not falling apart, about an hour. Allow the liquid to cook off, so that the bottom caramelizes a bit. Stir the cabbage to incorporate the browned cabbage. Serve immediately. Top with poached egg and Sriracha sauce if desired.